The 2010 corn crop was one of the earliest-planted It is time to put an “ear” to the ground. The 2010 season was also one of the warmest on record, with more 30-degree C days than in any year in the last 75 years. 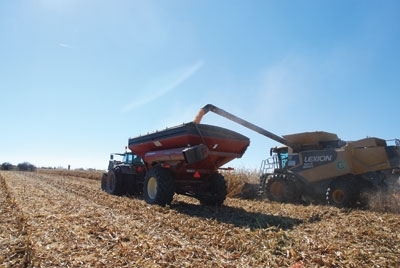 “Early April plantings allowed most areas to receive 200 to 300 corn heat units (CHUs) more than what they would normally receive,” says Sagriff. Growers have also been taking advantage of the stress tolerance bred into today’s hybrids by increasing their seeding rates. Although using a higher population increases inter-plant competition and may lower individual plant yield, it increases yield per unit area by optimizing yield components, including ears per acre, kernels per ear and weight per kernel. “In 2010, it’s believed that farmers in Ontario will have approached an overall seed drop of nearly 32,000 seeds per acre,” says Sagriff. The software accounts for soil type, corn heat units, long-term average yield or expected yield, previous crop, futures contract price and the cost of N. It provides suggestions for pre-plant N and side-dress N application rates. “These factors are always in flux a little bit, but the calculator gives you a feel for your land and can moderate leaps of judgment,” says Stewart.